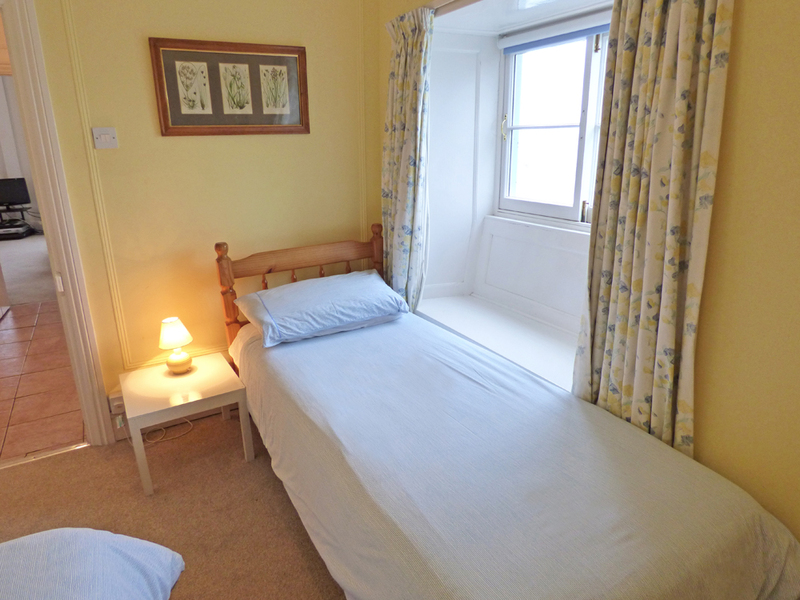 The Cabin is a first floor apartment, one of the most sought after holiday properties in Tenby, set at the end of Pier Hill with the Harbour on one side and Carmarthen Bay on the other. 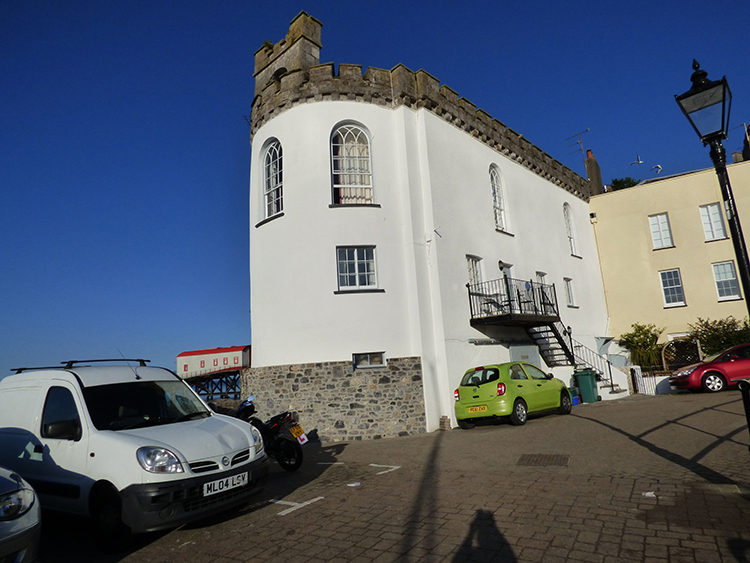 It is part of a Grade II listed building, and is probably the most architecturally important building in the town - a real gem, which has been sympathetically restored over the last 10 years. The balcony on the Harbour side catches the sun for most of the day and is the perfect elevated spot to enjoy a glass of wine as you watch your children play on the beach and the bustling harbour below. 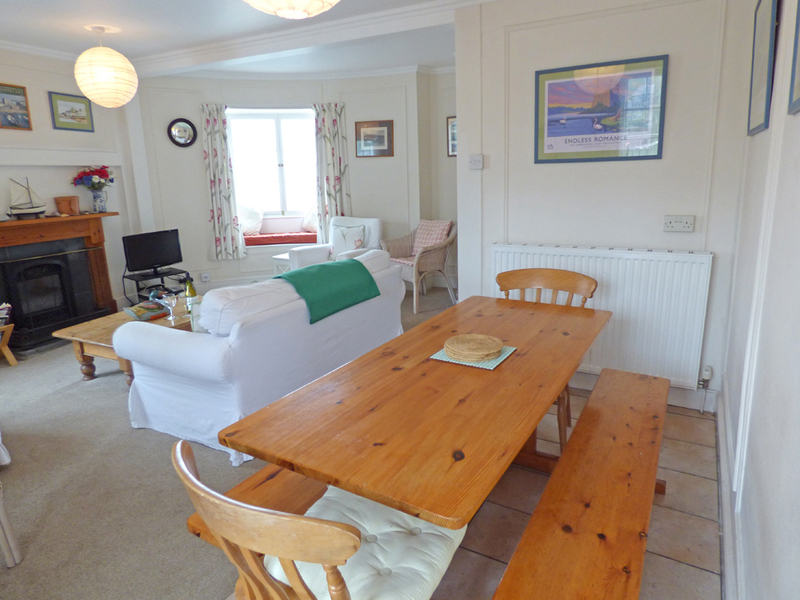 The building rises from the sea wall and is beautifully maintained and furnished. 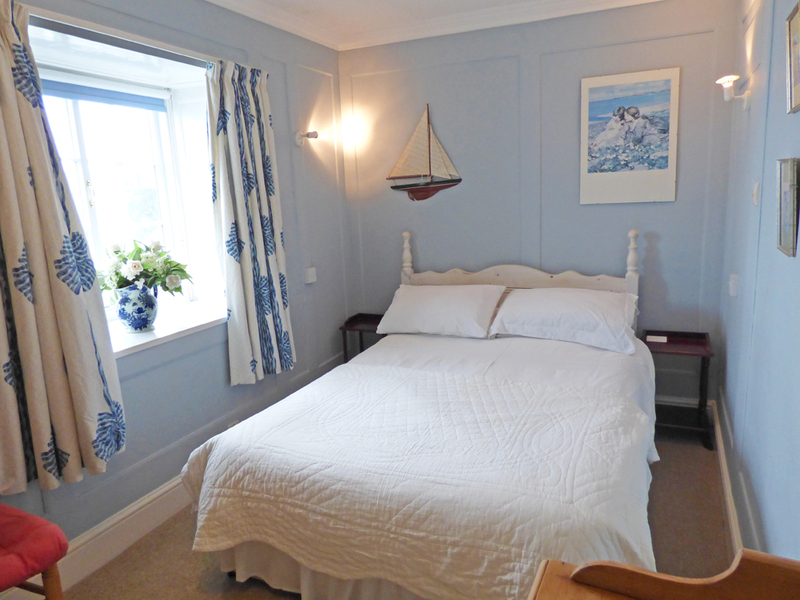 Every room has wonderful, but different sea views of the harbour and across the bay. The sunsets and sunrises across the bay are to die for. 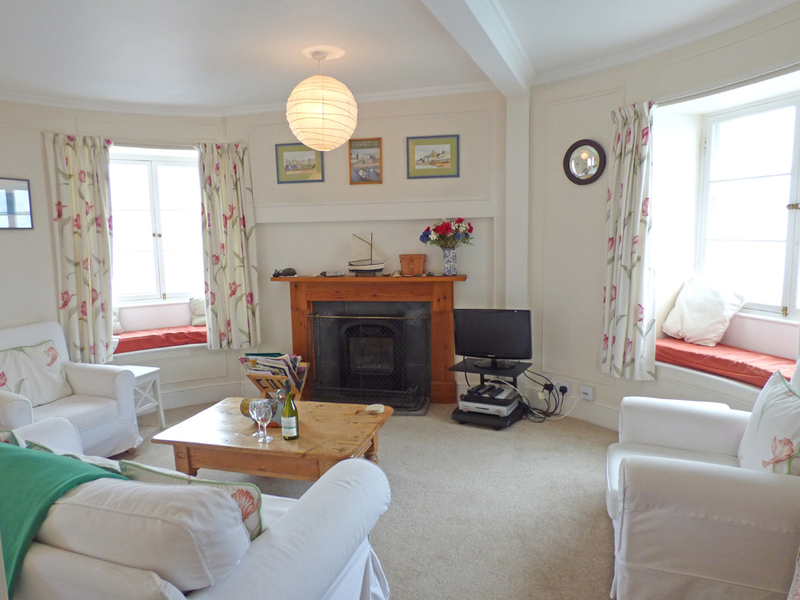 This is an amazing holiday home you will just not want to leave. Children under 1 years old are welcome. No other children under 10 years. No groups of unaccompanied under 18 year olds. 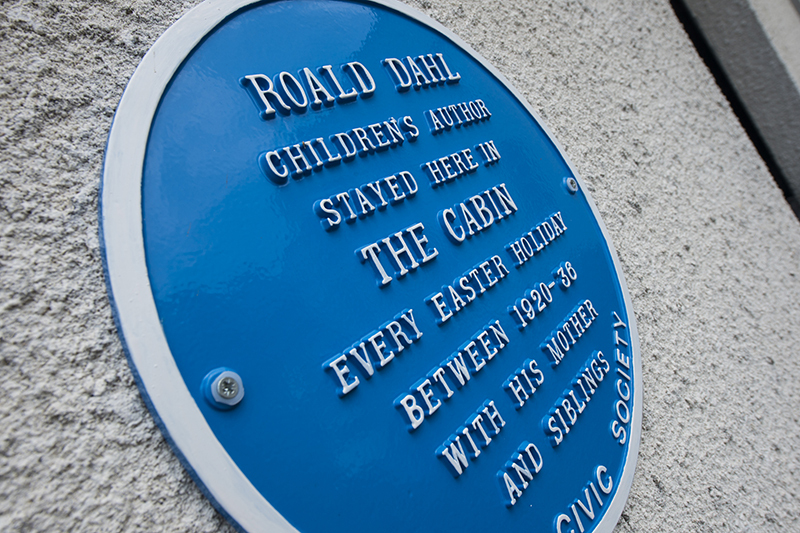 The Cabin has been awarded a blue plaque to mark the fact that Roald Dahl, used to stay here at Easter every year during his childhood and adolescence, until just before World War II. First Floor: Balcony, entrance hall, kitchen, sitting/dining room, bathroom/shower attachment/whb, shower room/whb/wc, separate whb/wc, twin room with 2ft 6 inch wide beds with interconnecting door to double room with an interconnecting door to double/king size bed - zip & link for double/kingsize or twin (2ft 6 inch wide) option/whb - interconnecting door to the kitchen. Heating: Gas central heating, gas 'real flame' fire. Electricity: & hotwater: FREE. GAS CENTRAL HEATING: Available @ £40 per week Oct - April, May - Sept on request at £30 per week. Parking: 1 quayside space - parking permit. 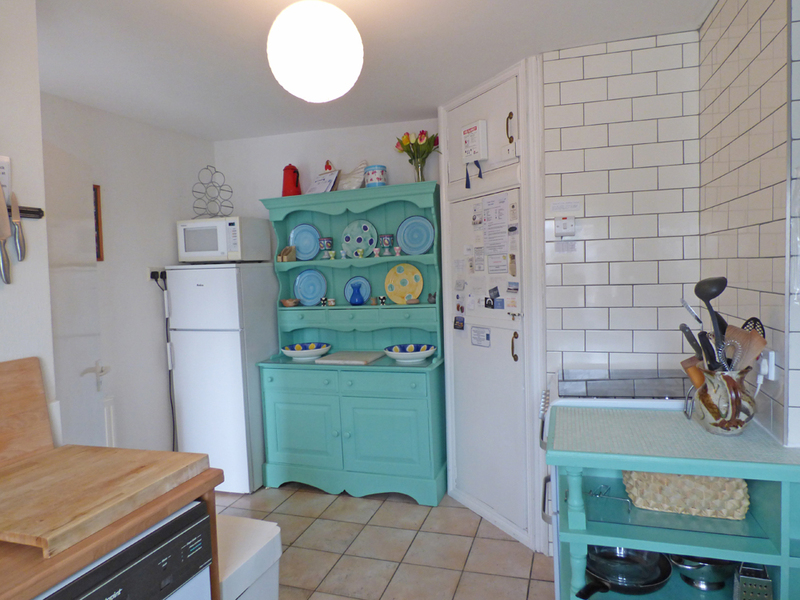 Facilities: Gas cooker, microwave, fridge/freezer, dishwasher, washer/dryer, TV/Sky, phone - incoming calls only, WiFi. 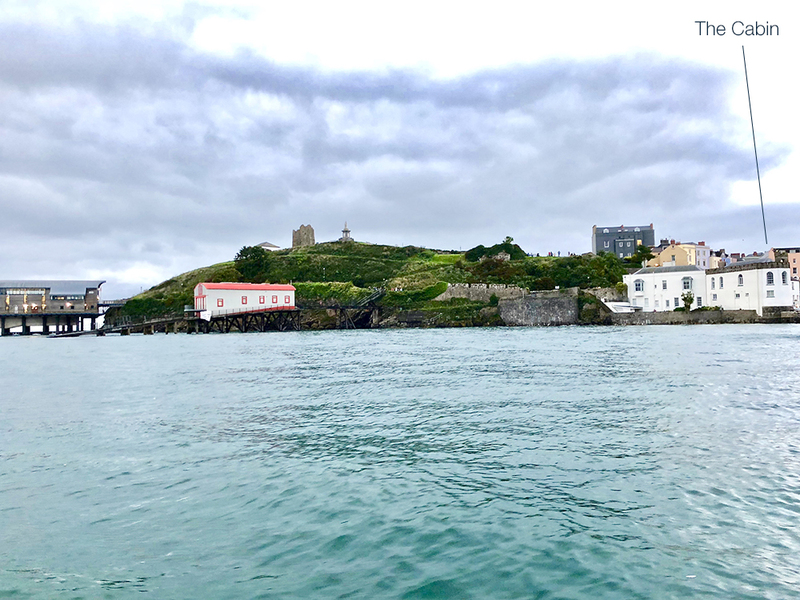 Tenby Lifeboat Station is currently operated by the RNLI, and has two lifeboats - one a Tamar Class All Weather Lifeboat and another, a D Class Inshore Lifeboat. 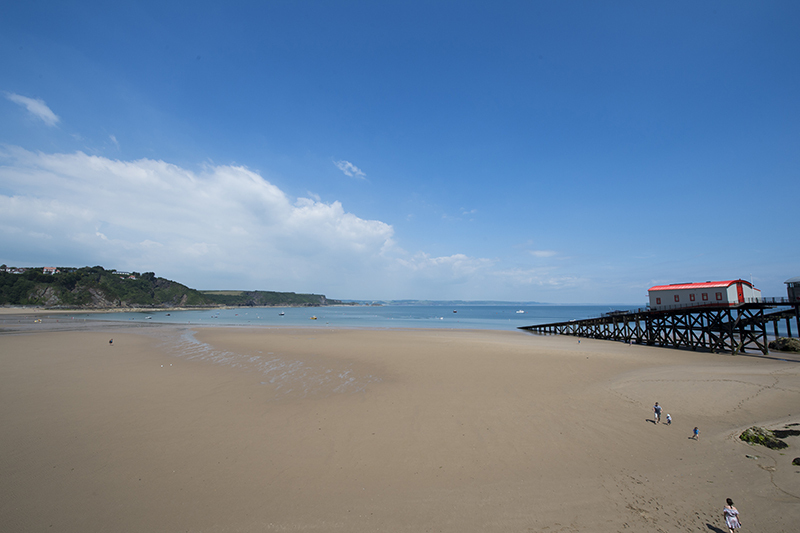 Tenby's Lifeboat Station is open to the public all year around, with a chance to take a look at the history of the station and the crews which worked there. 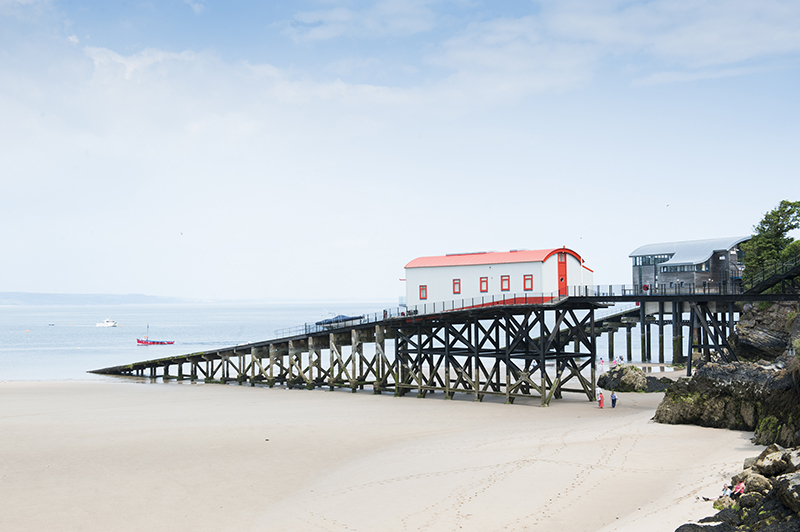 You will also be able to spot the old lifeboat station (with the red roof) situated alongside the new - the old is not open to the public, however it is still interesting to view from the outside. The Stowaway is a lovely tiny cafe, full of character tucked into the harbour wall on route to the Harbour beach in Tenby. They serve great coffee, cakes, snacks and crab sandwiches. Perfect for a pit stop be fore heading to the beach. Plantagenet House is a quirky little restaurant situated in a small side street just off Tudor Square. Once a tearoom, this pub is now a candlelit restaurant with three different dining rooms. They make use of lots of local produce particularly fish with seafood dishes often featured on the menus. 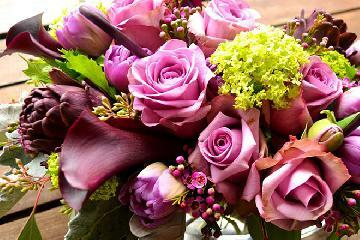 They offer light lunch menus as well as evening meals, a children's menu, a vegetarian menu. Please Note: Dogs are welcomed in the Quay Room. Heading down towards the harbour and the beach at Tenby and you can't miss the Hope and Anchor pub recently ungoing a refubishment. Traditionally a fishing pub it has remained popular with locals for years and years. They offer seven real ales that change throughout the week and the menus and special boards feature lots of fish inclding Tenby mackerel. Located in the town square, the Lifeboat is a nautical themed pub with a boat shaped bar! and a sunny beer garden to the rear (heated at night). Serving locally sourced food. Please Note: Dogs are allowed in the beer garden only. Head to the Qube for breakfast, lunch or an evening meal! Open all day, this restaurant serves classic dishes as well as fine dining dishes, with a range of vegetarian and fish dishes making appearances on their specials board. 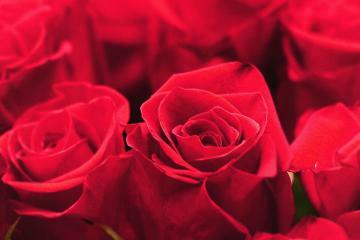 The menu boasts local produce, and an extensive wine list. Take the children along between the hours of 5pm and 6pm where they can eat free, or pop in for Sunday lunch. They regularly put on Tapas Nights where you'll be able to hear live music. 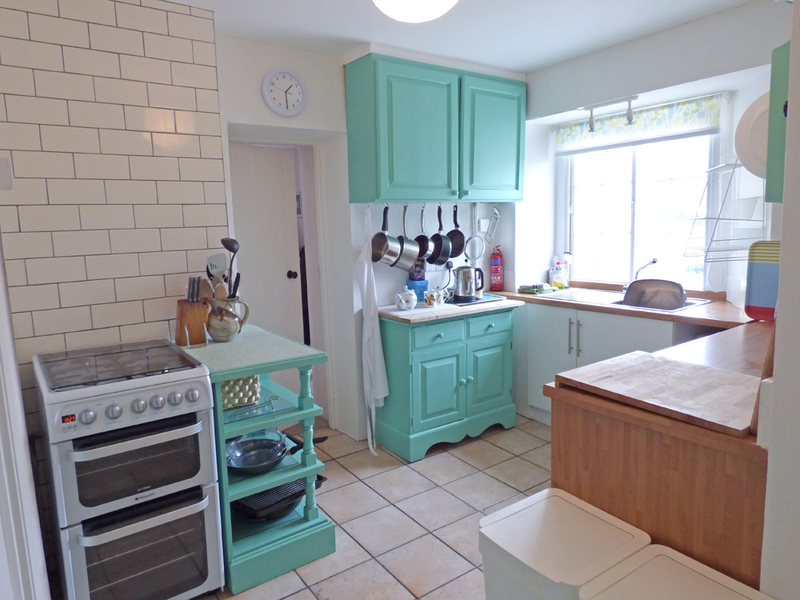 The lighthouse kitchen prides themselves on delivering top notch grub in an informal setting. They use local produce where possible to give you the best. 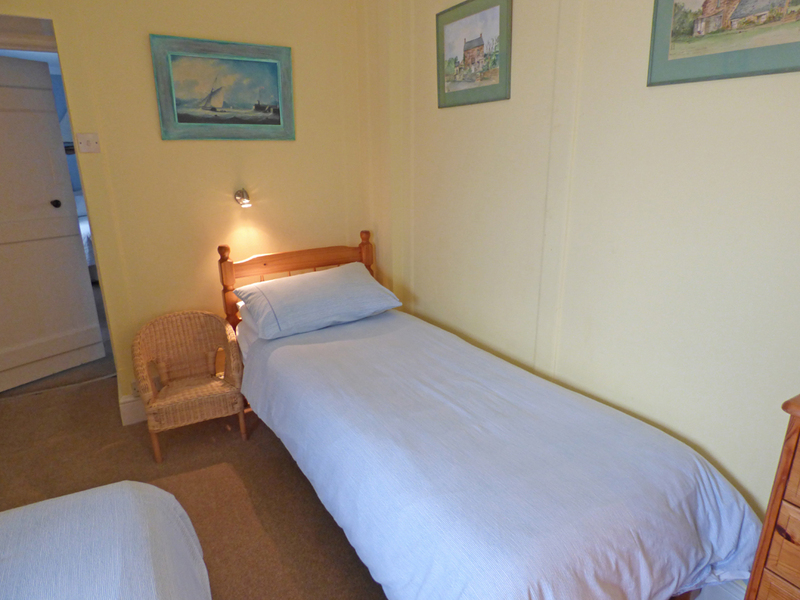 The Buccaneer is situated in St Julian Street which links the town square to the harbour and beaches. 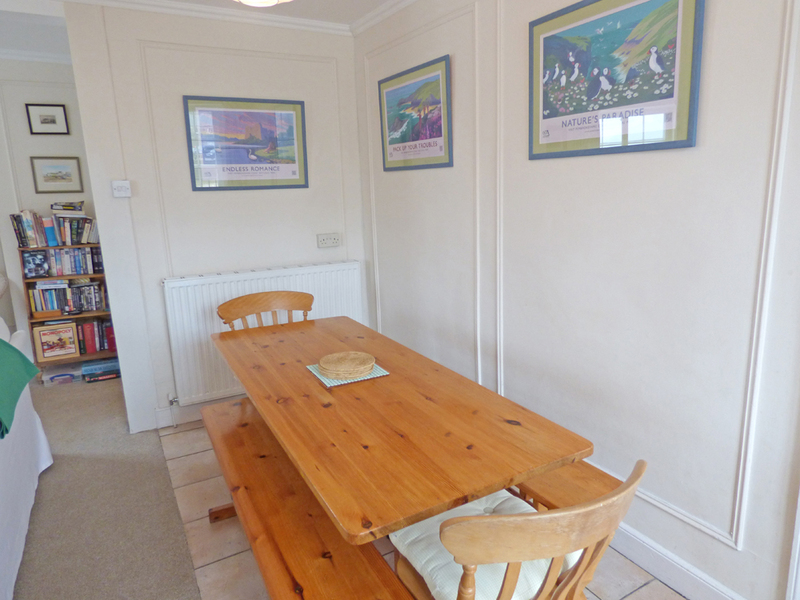 The pub has a large it has a cosy feel with wooden beams, stove and Tenby memorabilia adorning the walls. A sunny walled beer garden with ample additional seating is to the rear with heaters for those chilly evenings. 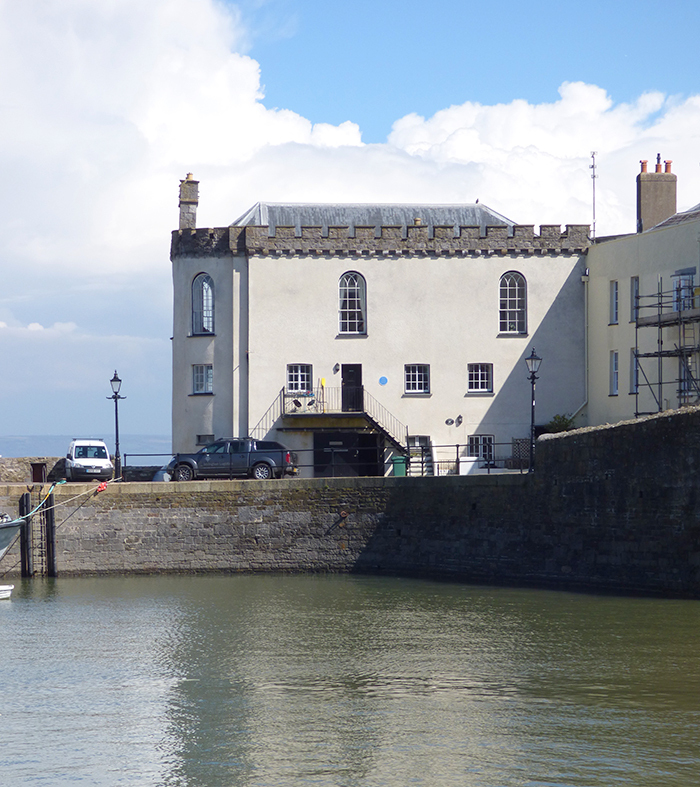 The Buccaneer is the brewery tap for the adjacent Tenby Harbour Brewery and sells their full range of beers. A good selection of European draught lagers are also available. Food is served all day with locally sourced fresh fish and ingredients on the menu. 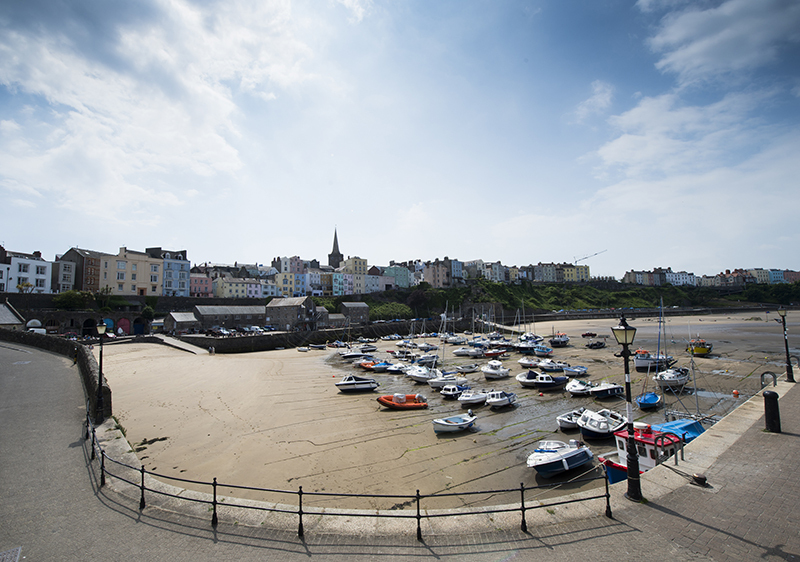 The Tenby House Hotel is situated in the centre of Tenby just on Tudor Square, within walking distance of Tenby's sandy beaches. Pop in for a cold pint on a sunny day or sample a bite to eat from their menu of freshly prepared meals. Sit back and relax with Sky Sports, or soak up the sunshine in their beer garden! 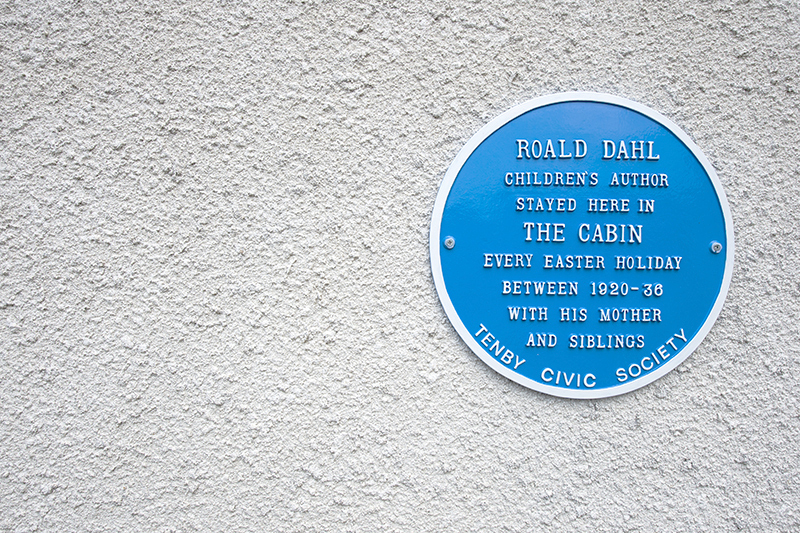 A Traditional restaurant in the heart of Tenby's charming Tudor Square. They are open all year around, serving meals and drinks from 11am to 10.30pm in the summer months. 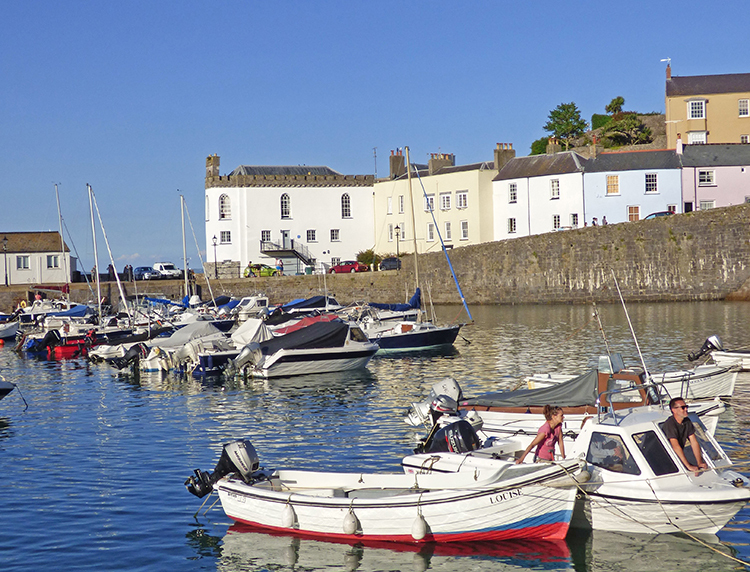 Their menu incorporates local produce wherever possible including fish caught just off Tenby's coast! They cater for vegetarians and have a varied children's menu. Open for breakfast, lunch and evening meals. The Moorings is a Cafe by day and a Restaurant by night. A beautifully decorated restaurant with a beach hut and seaside theme with a relaxed atmosphere. Homemade soups, cakes and dishes available and local sorted ingredient and produce used, fresh fish and specials available. 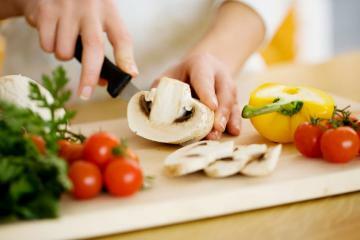 They also can accommodate any specific dietary requirements or intolerances. First recorded as a Norman Castle in 1116, Narberth Castle bears the legend that it was once a palace described in the mythical tales of Mabinogion. Unfortunately, very little of the stone structure remains but you can see that it was once rectangular in shape with circular towers. By the end of the 20th Century, Narberth Castle was derelict and so in 2006, renovations took place and it was opened to the public. 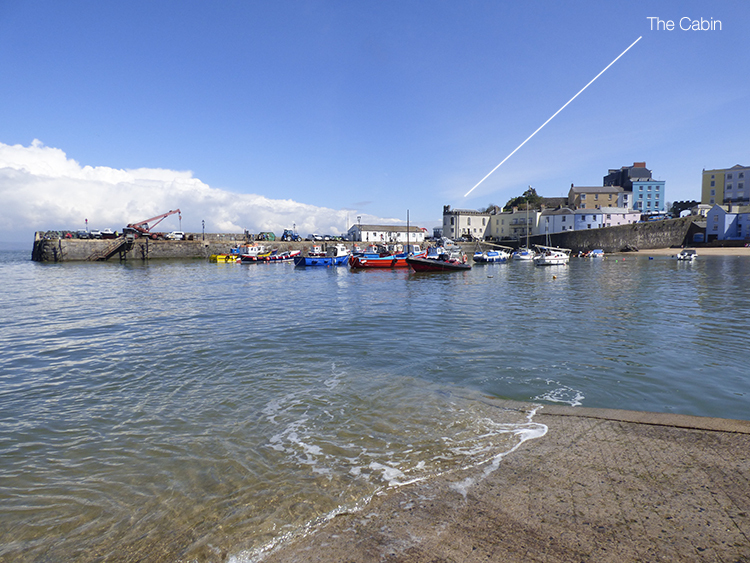 Hottest day of the year and the triathlon is in Tenby. Glad that The Cabin remains cool, but enjoying the sunshine. A great week as always, we'll be back next year! 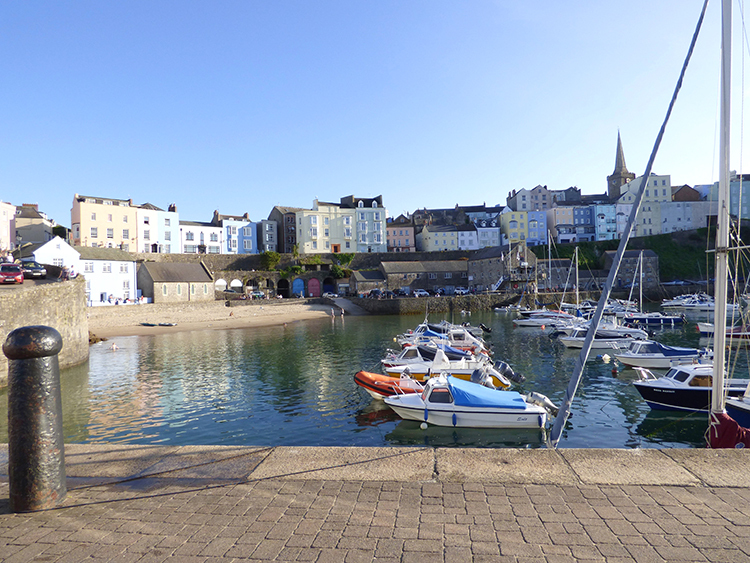 Special week in Tenby, Wonderful quality time with the family. Amazing weather- such special times. The Cabin is a fantastic retreat with a lovely touch enjoyed it sitting on the balcony - views were amazing. Hope to return next year! Initial approach: down a steep hill. Parking: A parking permit is paid for, but this does not necessarily allow you to park outside The Cabin, it could be up the hill or behind the buildings up the hill (There are not enough parking spaces for all the occupants of the flats, so you need to get there early). Entrance: to The Cabin is up steps to the only entrance on the first floor. There are handrails. There are 6 slate steps up to a landing, the steps then turn at right angles left and are 8 wooden up to the next landing outside the front door. There are 14 steps in all. There is no ramp to the main entrance, since the level of the landing and the floor inside are the same. There are no other entrances. There are no changing levels within the lf at. 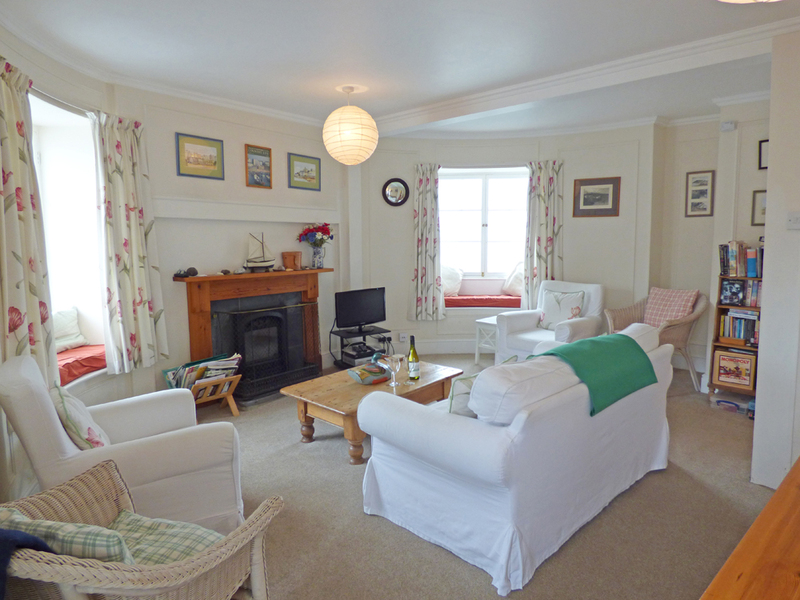 There are some differences between the colour of the walls and the floors, but the door insets are almost the same colour as the walls in the sitting room (cream walls, white door insets and doors). 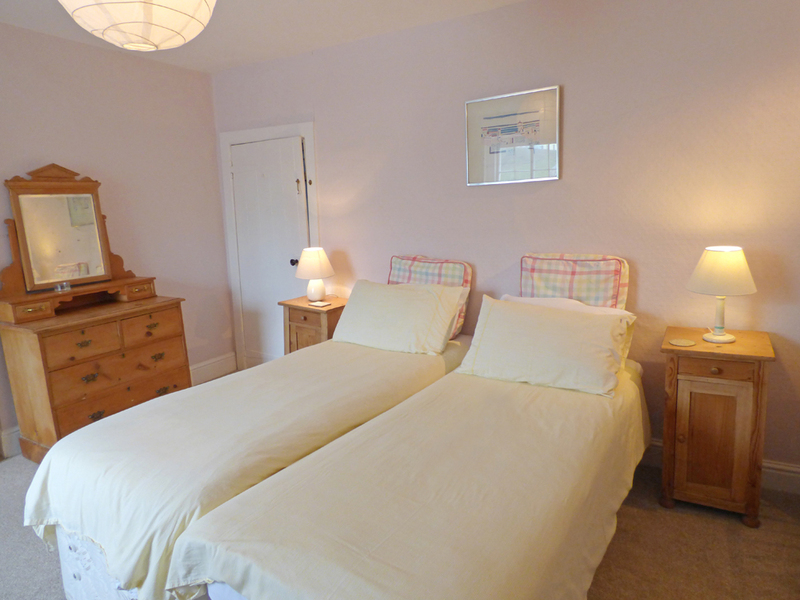 The bedrooms have coloured walls (very pale pink, yellow and blue) and white door insets and doors. 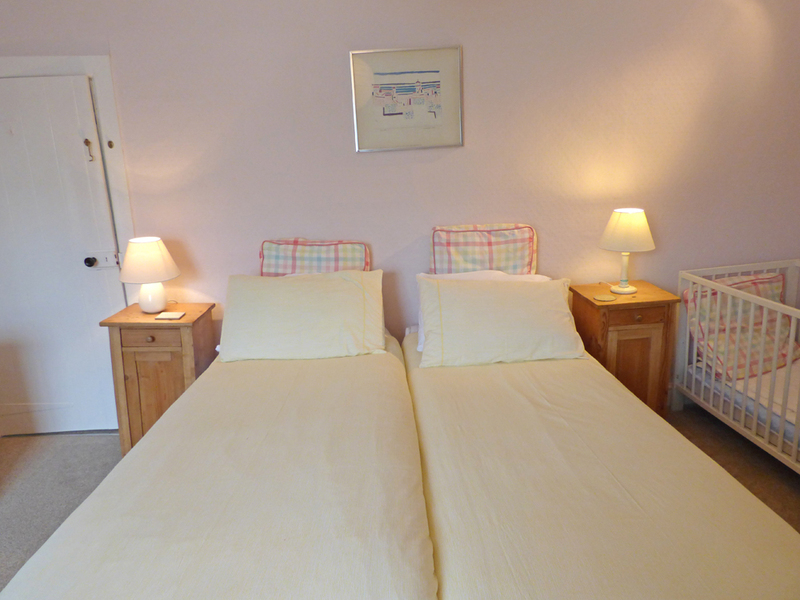 The bathroom, shower room and loo, and separate loo are painted white and so are the door insets and doors. 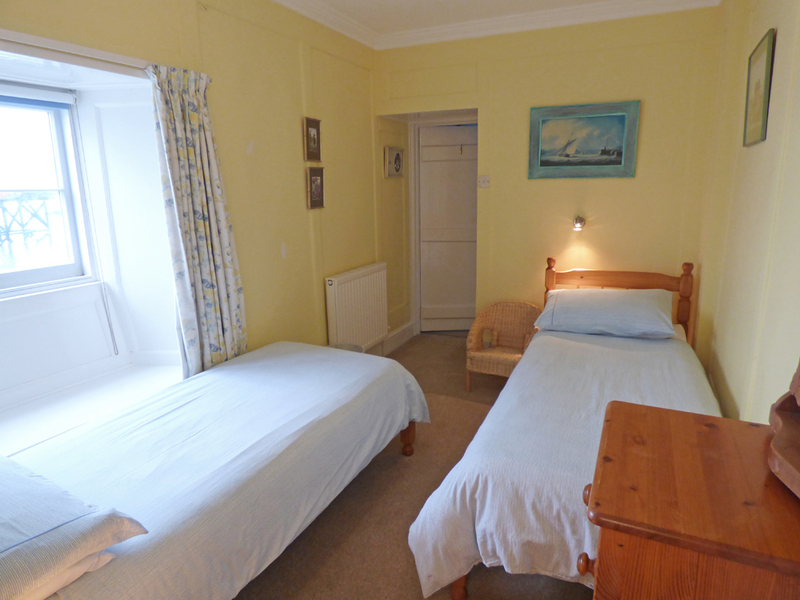 All the rooms interconnect apart from the bathroom, shower room and loo and separate loo, which are reached through a narrow corridor between the sitting room and the yellow room. There is external lighting above the front door, switched on from inside the flat. There is a telephone but only for incoming calls. There is a Sky TV. Guide dogs are not welcome. Public transport is available at the top of the hill on an hourly basis. How would you like to contact us about The Cabin?